This morning I wanted to test something. I recently heard a claim. The claim was that you should not connect a tantalum capacitor the wrong way because it will burst into flames. And I decided to test. So I set up a test circuit in the kitchen this morning, while my wife was still sleeping. And I set up my camera to capture the moment. I connected my tantalum capacitor with a 9V battery the wrong way, but nothing happened. 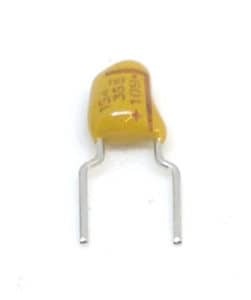 I did some research and found plenty of examples of these capacitors blowing up. So maybe it’s just some types or specific values that blow up. And the lesson is: Don’t connect the tantalum capacitor the wrong way.